The London production of “Skylight,” starring Bill Nighy and Cary Mulligan, will be broadcast by the National Theatre Live Oct. 30 around the country and open on Broadway in the Spring with its original London cast. Can’t get to Broadway to see the National Theatre production of “Skylight” with Bill Nighy and Carey Mulligan. Try your local movie complex or university instead. The National Theatre Live’s mission is “to broadcast the best of British theatre live from the London stage to cinemas across the UK and around the world” and I, for one. am grateful. Nothing beats seeing theater live, but not everyone lives close to theaters producing new and/or classic work on a regular basis. 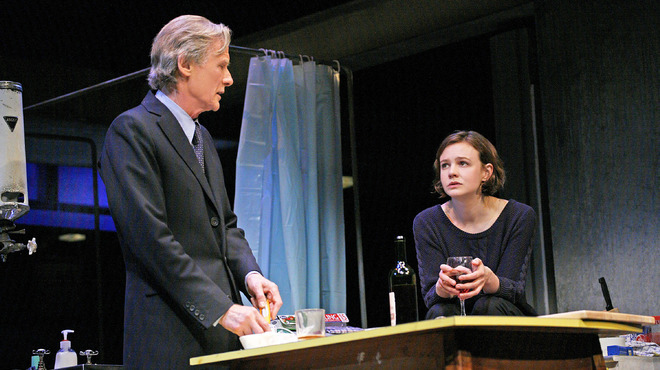 The London production of “Skylight,” starring Bill Nighy and Carey Mulligan, will be broadcast by the National Theatre Live during October around the country and open on Broadway in the Spring with its original London cast. Playbill.com reports Carey Mulligan and Bill Nighy will return to Broadway in David Hare’s “Skylight” beginning March 16 for a 13-week limited engagement through June 14. If you can’t wait, you can always catch the National Theatre Live broadcast of the London production in October at venues around the USA. “Experience the best of British theatre at a cinema near you” is the slogan on its homepage. Different venues may offer the viewing on different days. I’ve taken my kids (in their early 20s) to NTL events about six times at the Pollack Theatre at Monmouth University in West Long Branch, NJ, and we enjoyed ourselves . We’ve seen both “The Curious Incident of the Dog in the Night-Time” and “The Audience,” both of which are scheduled for Broadway this season, beginning Sept. 9 and Feb. 17, respectively. “Skylight” will be shown at Monmouth U Oct. 30. “Skylights” original cast of Carey Mulligan, Bill Nighy and Matthew Beard will transfer across the pond in the show directed by the brilliant Stephen Daldry. He took English dramatist J. B. Priestley’s classic 1946 warhorse of a show, “An Inspector Calls,” and turned it into an astonishingly modern piece on theater. It won the Tony Award for the 1994 Best Revival of a Play and Daldry went home with the Best Direction of a Play award. The set designer and lighting designer also won Tonys. — For more info on “Skylight” and a video of the production, click here. — For a list of NTL shows, venues in the NY metropolitan area, videos and more, click here. — For the Playbill.com report, click here.